The Toyota Hilux solidified its reputation as one of the world’s toughest trucks when Top Gear put one through absolute hell, and took another up a volcano. However, there’s one part of the Hilux that’s pretty easy to destroy, and that’s its tires—via burnout, of course. 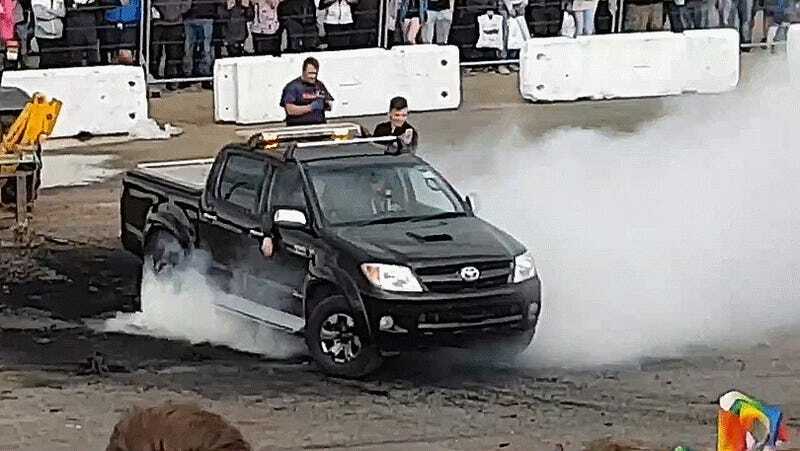 The light bar atop this Toyota Hilux suggests that it’s a support vehicle for this Ultimate Street Car Event, but regardless, it’s in for some burnout action. Never mind that little bit of burn at the end. It’s just a little fire! It barely even toasted the fenders back there.